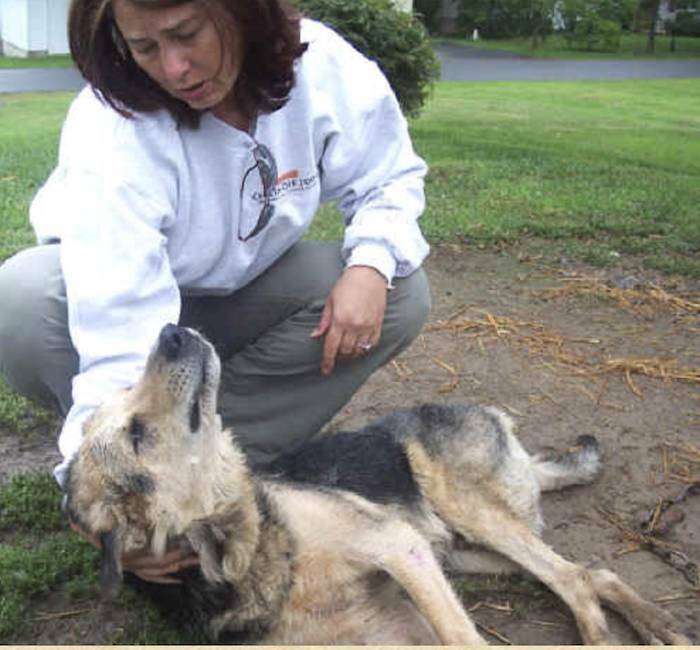 Tammy Grimes, original founder of Dogs Deserve Better, was arrested September 11, 2006 for helping a dying chained dog named Doogie who could not stand in East Freedom, Pennsylvania. Below are the details of the case, with photo and video documentation. Tammy's statement: "I made a hard decision; I could not have lived with myself or looked myself in the eye if I were such a coward as to leave Doogie lying there dying on the ground for fear of what would happen to me. I see this case as a travesty against justice...the true perpetrators of a crime are the people who left Doogie to lie there dying for three days without doing right by him. I am very saddened that we live in a society where people have to be afraid to do the right thing, to help those in need, whether that need be human or animal. Arrests such as mine are a pitiful statement for America, and I ask all dog lovers to stand with me to insist that all charges against me are dropped and charges of animal cruelty are instead placed against the Arnolds of East Freedom, PA. The Arnolds who left Doogie to die. This video truly speaks for itself, and for Doogie. I did what was morally right; I stand by my decision to help him and will be proud of it until my dying day. No one can take that from me." We got a call from Kim Eicher in East Freedom 9/11/06, crying because Doogie hadn't gotten up since Saturday. She had been calling the Central Pennsylvania Humane Society since Saturday to no avail. We told her we aren't law officers, and she needed to call the Humane Officer. We told her to make sure she left a message, very clearly, about the problem. Then we got another call about the same dog, from another person who passes him every day. At that point we called Kim back to see if she'd heard from the Humane Officer. She had not, was very, very upset and we were very worried about him, so we promised her we'd go out and see what we could do. When we arrived, we took photos and video of Doogie. We initially thought he was dead, as he was not moving and his back was to us. We found out that the people were not home to talk to about him, so I made the decision that I would not leave him lying there on the cold wet ground for one moment longer, and I would accept all consequences of my decision. Kim Eicher has agreed to testify as to the animal cruelty perpetrated against Doogie. She cried the whole time we were there, you can hear her on the video. I think once you see the video and pictures, you'll understand why I made this decision. The vet documented his general negligent condition, low weight, sores, missing fur, and took x-rays of his back and hips. He determined that he has very bad back spurs that are causing him a lot of pain and are most likely responsible for his inability to walk. He also saw an undetermined mass near his hip on the x-ray. He gave him a shot for pain plus some B vitamins for energy, so that perhaps he could have even one good day or a few good hours. He wrote a letter stating his condition. As we got to the vet, the CPHS Humane Officer Gotshall was just leaving, and he stopped us. He was about to go out to the residence. When he found out we had Doogie with us, he was not happy. I volunteered to take Doogie back and he could pick him up instead. He refused that, and stated that I should get him the vet care he needed, and to call him afterward on his cell. When I later called him, he did not answer, I left a message asking him what he wanted me to do with Doogie, he never called back. Shortly after we got Doogie to my home, situated, bathed—had to, the stench was too bad—and fed and watered an Officer Flaig called from the Freedom Township Police Department (Freedom, isn't that ironic?). He wanted me to return Doogie, which I refused to do. I explained that I had video and photos documenting the animal cruelty, and the neighbor was willing to testify; why didn't he pursue that as they were the perpetrators of the crime, and should be charged? He refused, and was not interested in seeing my evidence. He and three other police vehicles arrived at my home at approximately 9:30 p.m. As I refused to hand Doogie over to be returned to death on a chain, and would not tell them where he was, I was taken into custody, transported to the East Freedom police office, and charged with theft, receiving stolen property, criminal mischief, and criminal trespass. I was released on $50,000 unsecured bond and ordered to appear at a preliminary hearing September 21, 2006. I was treated like a common criminal, especially by Chief Reilly, who called me a 'freakin' idiot', 'incompetent', and I overheard him telling Officer Flaig that if I ever came near his dog I would have a slug in my a**. Again, there was no interest in any evidence that the dog had been abused or criminally neglected. As far as they were concerned, the dog's safety or condition was not even an issue. I was released after seeing Judge Aigner, where Chief Reilly asked that I be not given bail but incarcerated for my failure to cooperate. It was 2:00 a.m., and I had no ride home, over 30 miles away. I had to walk to a local all-night store to call and get a cab, because there was no concern over how I would get home. Their attempt to dehumanize me didn't work. I held my head high and still do. I looked Chief Reilly square in the eye at every opportunity. I will not be broken. Here's what I need from you all. View the videos and photos. I think you'll agree with me that this is NOT acceptable in ANY way in any kind of civilized society. We cannot allow this kind of animal abuse. Period. Not ifs, ands, or buts. Insist that all charges against Tammy Grimes are dropped and animal cruelty charges are instead filed against the Arnolds of East Freedom, Pennsylvania. Pass along the photos and the video, or a link to it, as much as you possibly can.